Use Rhizopon AA Water Soluble Tablet and Hortus IBA Water Soluble Salts rooting solutions (at the same concentration) as technical IBA, or K-IBA, or the same IBA concentration as commercial alcohol based premixed rooting solutions. Rhizopon AA Water Soluble Tablets and Hortus IBA Water Soluble Salts rooting solutions NEVER HAVE ALCOHOL BURN because the are dissolved in ordinary water. The same rooting solutions can by used by Spray Drip Down®, Total Immerse, Basal Quick Dip and Basal Long Soak. Use the pre-dosed tablets with water to make your own freshest solutions in any concentration. You measure the dosage by simply counting tablets and mix into water. A scale is not needed. 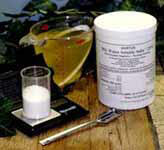 Use the easy to measure powder with water to make your own freshest solutions in any concentration. You can make solutions to over 100,000 ppm IBA active ingredients. The Salts are an economical for making large solution volumes. Hortus IBA Water Soluble Salts is an easier to use and registered replacement technical IBA and K-IBA. RHIZOPON AA WATER SOLUBLE TABLETS and HORTUS IBA WATER SOLUBLE SALTS are completely free of potentially phyto-toxic and flammable alcohol. You make solutions from very dilute to extremely concentrated. The solutions are odorless. Both are US EPA registered with WPS Zero Hour REI. Growers can apply the products and remain in the growing area.